Everyone has one person in their life who has added that extra little something to your life. I have been one of the fortunate people to have more than one but today I want to give a special shout out to my Grandmother who is 93. She over the last few years has become known as “Foof” because my oldest daughter could not say Nana Rose Ella when she started to talk so she would say “Foof” instead. So she has taken on the nickname for for 19 years. It is as unique of a name as she is a woman. My Grandma has never finished school. In fact, she had to stop going to school in the 6th grade when her family migrated to Utah from Italy. She had to quit school to work on her family’s farm to milk cows. She developed arthritis at a young age from milking those cows at the age of forty. So as long as I have known her, she has had crooked hands deformed from the debilitating disease. She never owned a real paying job but she worked harder than any woman I know. She raised her own children and raised her children’s children. My parents divorced when I was very young. My father was an addict and abusing to us so we had to live in the basement that my Grandfather built with his own two hands. My mother had to work full time because my father never paid child support so when it came time for my brother and I to start school but were to small to ride the school bus, Foof had to learn how to drive in order to pick us up. She helped us with our homework and when we got old enough, we would teach her what we knew and she did not. She had a hot temper. Any Italian does. We are loud and passionate about everything. She was a strong disciplinarian. We feared her wrath because she love to throw things at us when we were making her mad. I grew up along side her two youngest boys. My mother’s siblings were spaced far apart. She fed us every meal. It was never fast food or store bought. It was raised in a garden or grown on a farm. We were frugal she said but, I believe we had very little money. She could make any food look good. I don’t even want to tell you some of the things that I ate in life growing up. But I will tell you this, there was no part of any animal raised that went to waste. She could do the best cartwheels, she loved to dance and she cursed like a sailor in Italian. We spent countless hours outside laying in the grass of the front yard taking and telling old stories while we gleaned what was harvested from our garden. My grandpa was an engineer for the Rio Grande Railroad and when he was away she was fun and energetic but when he was home, she was a very different women. She was quiet and never raised her voice to her husband. He ruled her, like he ruled us with an iron hand. Old school is what we called it. She would be on the phone taking to her family and when he would drive into the drive way she would hang up mid sentence and prevend she was tending to the food in the kitchen. When my grandfather died from his own hand was very sad day. But that day, she really began to live and grow. I guess he held her from going out into the real world. She began to go to lunch with her friends, driving everywhere, and she began a sewing class at church. We began to take her places with us on vacation. She was in her seventies the first time she went to Disneyland. My husband and I were newly weds and we took her to Disneyland. We seen life through her eyes. She was very much like a child when she encountered new places. She is so cute. A year ago, she got to be a Guinea pig to a new procedure for a heart doctor in Salt Lake City. She had a failing heart valve and she was too old to withstand a full heart surgery , so she agreed to be the very first person to receive a heart valve via balloon catheter. They would go into the heart by entering the femoral artery in her leg. They put a catheter in her leg and followed a wire into heart to the place where the valve was failing. They use a balloon catheter to open up a new valve pushing the old valve permanently open trapped underneath the new valve. It planted it self into position. It was a very successful surgery and she went down in the doctor history books forever. She has had better health than any of her children since that surgery. She was 92 years old. Since then life has taken a tole on her body. She has shrunk down five inches and is permanently in a wheel chair because of arthritis but her old ticker is like brand new and she like the energizer bunny keeps going and going. Her kids took her to Salt Lake City back to the hospital this last week because she was invited to be part of a special press event that she got to be the special guest speaker at. Many people’s live have been saved because she had pave the way for this new procedure for heart surgeons all over the world. She was Queen for the Day. They took her to the zoo as a special treat after the press event. The last time she had been was when we were small children. The photo I included in this blog was on of the many taken that day. 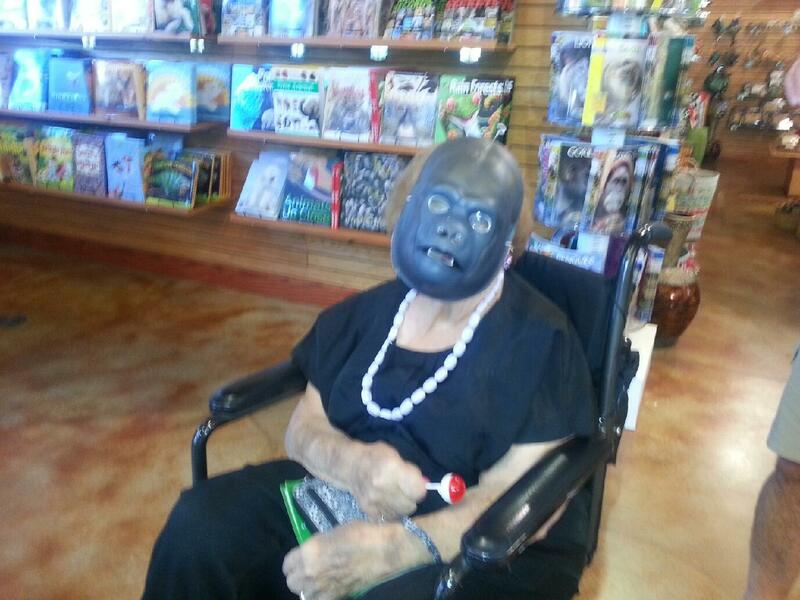 She had a blast and she brought a spirit to the zoo that day that left many people happy. Much like she has done for so many of us in our lives. A spirit that I believe makes me who I am today. I cherish the days that she has left on this earth. She has a heart like a child and I can see through her, why Christ says to have a heart like a child when it comes to hearing and believing his word. It take a child’s heart to have real faith and a passion for living. I thank the Lord every day for my Nana Foof and on the day she goes to be home with God, I am certain, heaven will be rejoicing.